Otis is one of the characters that will be prominently featured in Little Tentus, if I ever actually get the project going. 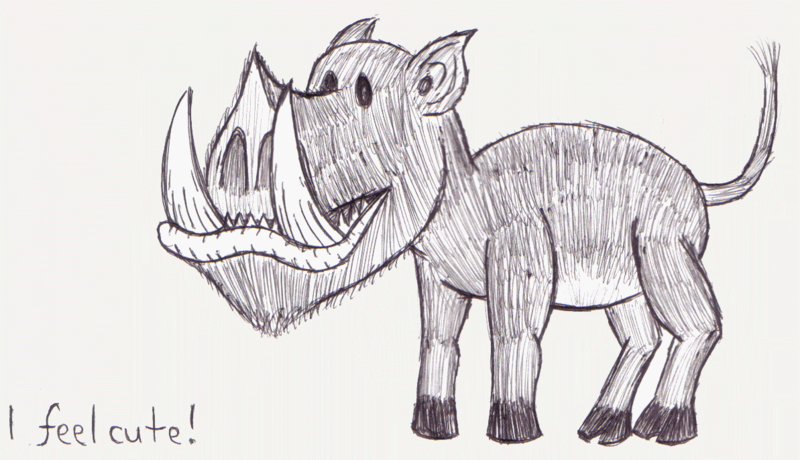 A benign, lovable warthog, Otis cheerfully accompanies the group everywhere they go, defending them with his strength whenever necessary. He has curious origins, at least in the real world. Otis is the name of my roommate's pet in World of Warcraft. We formed something of a group back in the day, and Otis became the group favorite. I felt that he should be immortalized somehow, so putting him in a convenient opening in the webcomic came naturally. Otis eats anything, and drinks anything... which can be a problem when the group is in civilized situations. He sort of falls into the hunter class, because he has corresponding abilities, but not being able to talk (and not being that smart anyway) causes difficulty in maximizing his usefulness.